Tendons are rope-like structures made of collagen fibers that join the muscles to the bones, which means that as you go about your day to day chores, your tendons take more heat than even the bones and the muscles. Add to this the fact that they are not particularly elastic yet offer a spring like mechanism, which keeps the joints and the bones moving in the right direction, and it easy to understand why inflamed, torn and broken tendons are common place. When subjected to constant stress or a sudden acute insult, tendons will often tear. You can compare this effect to the fraying of a rope that is put through more strain than it can handle or one that gets damaged over time. Much like the threads of the frayed rope, the collagen fibers of the tendons snap. Of course, this does not mean that the tendon completely gives way; just that it gets weakened due to the breaking of the collagen strands. Now, unlike a rope, the problem with the ripped collagen fibers is that they inevitably lead to an inflammatory response from the body, as do all injuries. Which Areas Of The Body Are Prone To Tendon Damage? Broken tendons are painful and often result in an ongoing pain. While tendons in any part of the body can break, the parts we use the most are more likely to suffer from broken or pulled tendons. 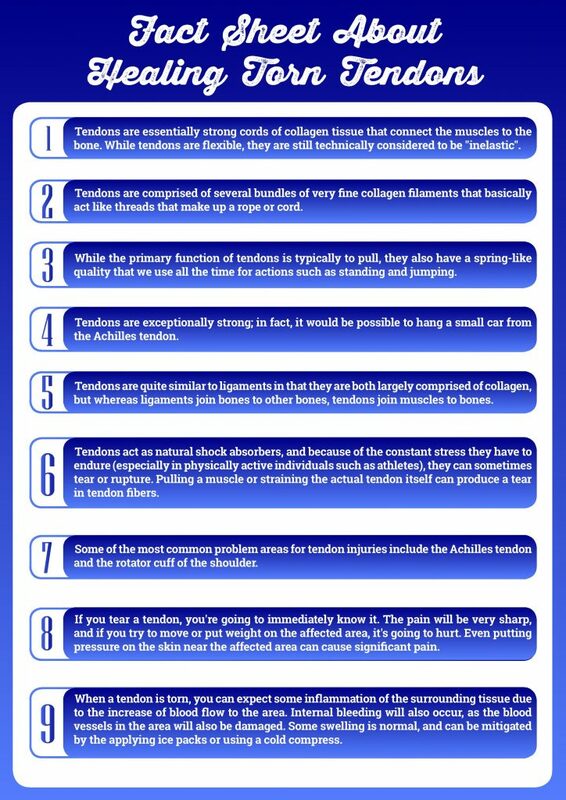 Areas that are vulnerable to broken tendons include elbows, shoulders, hips, wrists, knee, ankle, and heel. When it comes to healing broken, torn out or pulled tendons, essential oils are known to do a commendable job. Compared to medicines and other popular therapies, they are fastest at healing broken tendons. Before we delve into how essential oils can be useful in healing broken tendons, let’s understand what causes them in first place. 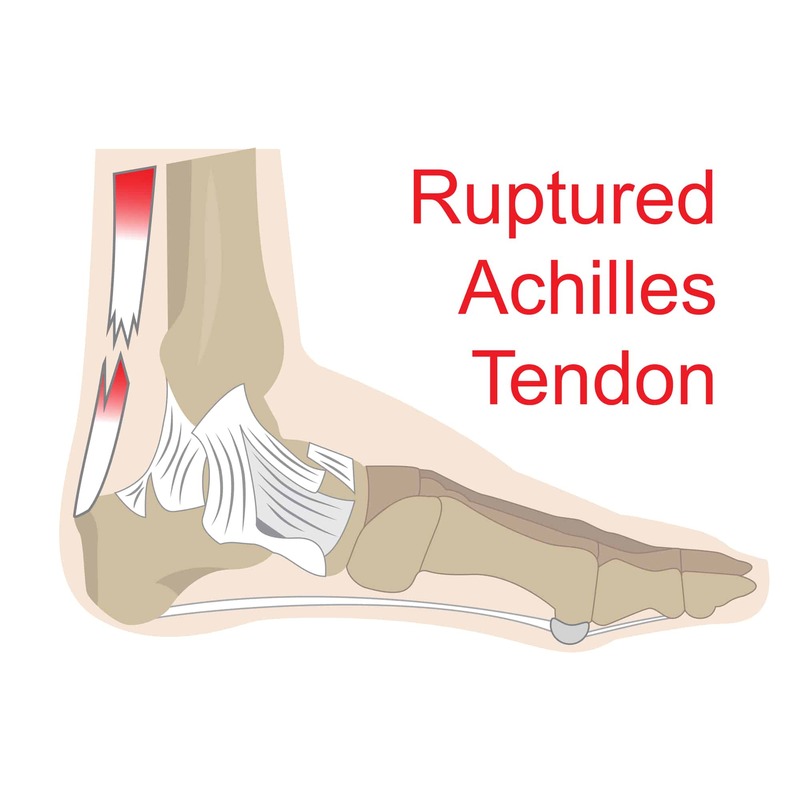 What Causes Torn & Ruptured Tendons? Sudden injury or an accident might pull a tendon causing unbearable pain and trauma. In such situation, first thing that is recommended is rest. Rest will also allow the essential oils to do their work in the best possible manner. It is easy to overuse a muscle by suddenly doing something that the muscle is not used to. In addition, not warming up and cooling down properly before and after a workout leads to lactic acid build up, which expands through the muscles affected and brings about broken tendons, pain and stiffness. Stress and anxiety can also make the muscles tense, especially in the shoulder and neck area, and therefore cause broken tendons. Stress and anxiety can also make the muscles tense, especially in the shoulder and neck area, and therefore causing broken tendons. 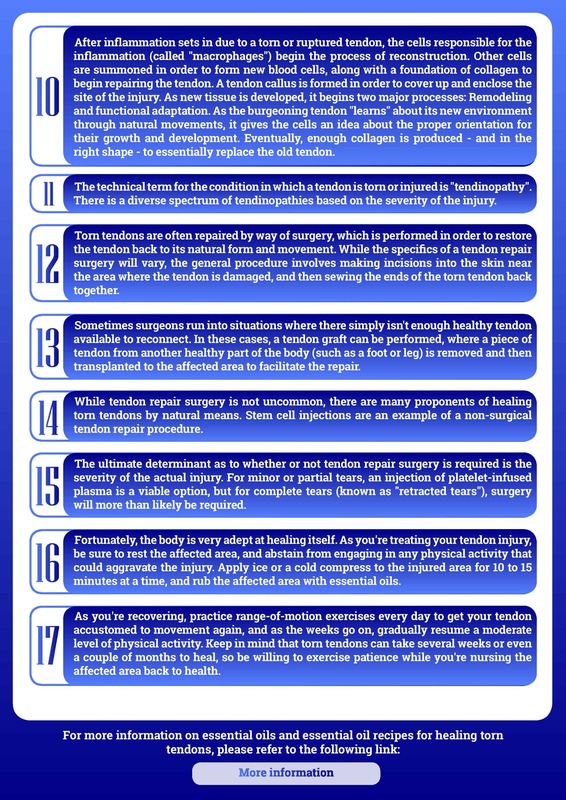 The two images below show 17 facts about broken tendons. 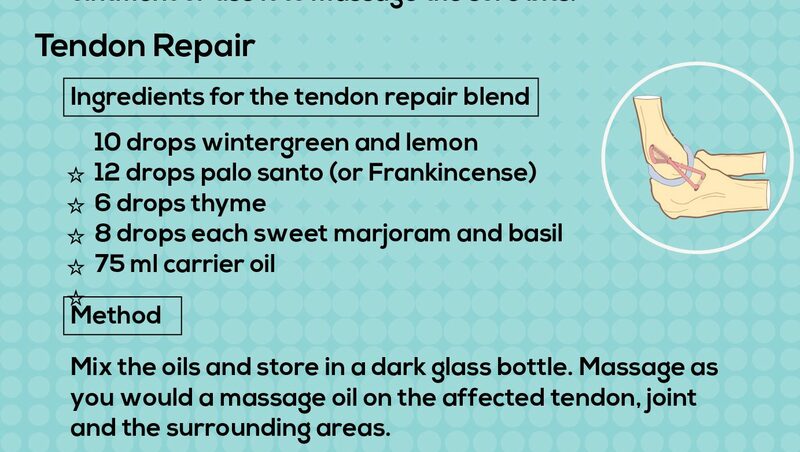 How Can Essential Oils Help With A Torn Tendon And The Pain That Results From Tendon Strain And Rupture? Unlike modern medicine, alternative therapies are not just about quick and temporary control of the pain. 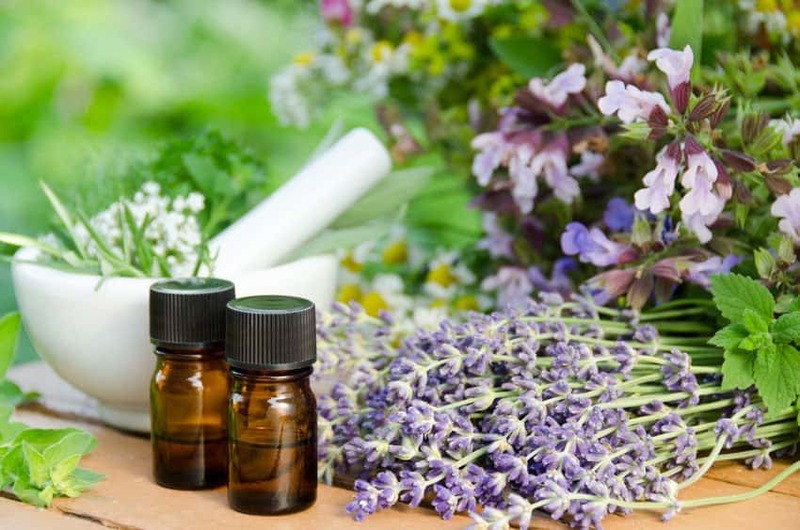 Essential oils offer multi-pronged benefits that help to deal with the core cause of the tendon pain as well as all the symptoms of the condition. The inflammation: Essential oils are remarkably effective when used against inflammation. They not only bring down the swelling but also speed up the removal of nitric oxide and accumulated lymph fluids. Furthermore, these extracts act on the inflammatory mechanism itself by modulating the immune system to limit the release of inflammatory proteins. The healing: With inflammatory modulators out of the scene and the toxins and accumulated fluids gone, there is a lower risk of a heightened immune response. So, the tissue heals faster. 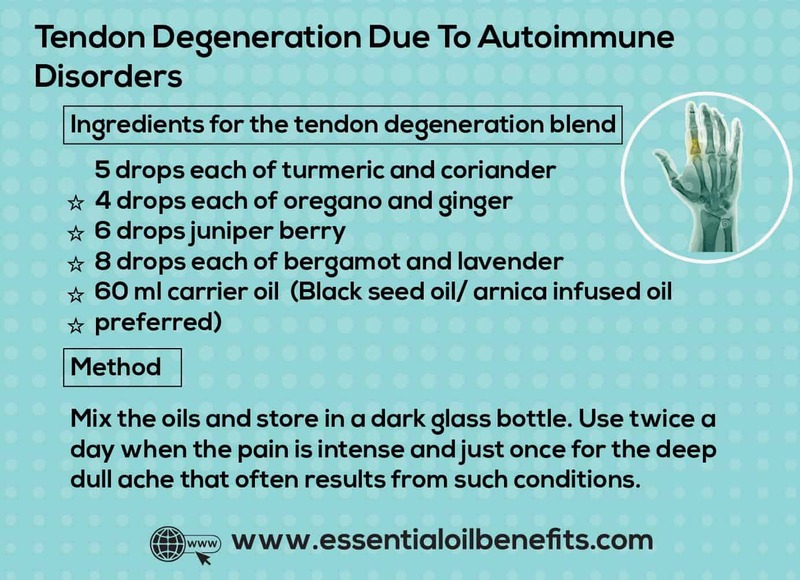 Plus, some essential oils actually support the quick regeneration of connective tissue. The pain: When inflammation is brought under control, pain begins to spiral down. Along with pain goes away the stress caused by it, which causes cortisol levels to plunge, further reducing the risk of widespread inflammation in the body. The need to move: Because essential oils control pain on the spot, without impacting gastric or liver health like OTC painkillers, they present a pain and side effect free way to start stretching and working out the injured tendon. This along with the ability of essential oils to boost circulation, helps the tendon to heal into a stronger version of its former self. 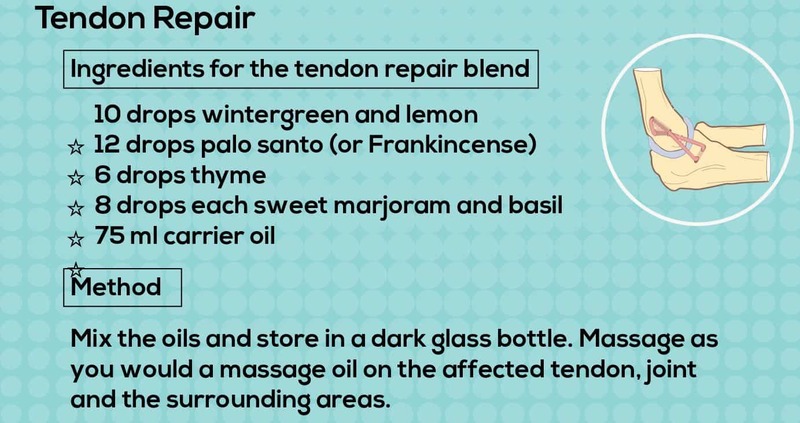 How To Use Essential Oils For A Torn & Ruptured Tendon And Other Problems Related To Tendon Health? Pain relief on the triple: A blend that contains heating and cooling oils can offer quick relief from pain, no matter how severe it is. 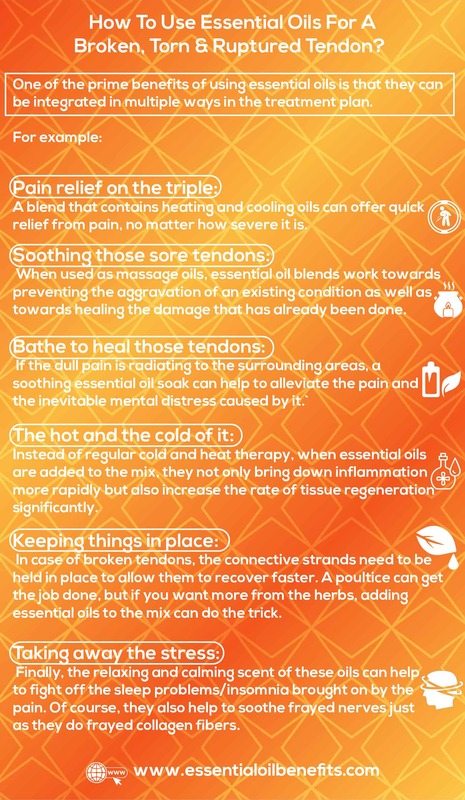 Soothing those sore tendons: When used as massage oils, essential oil blends work towards preventing the aggravation of an existing condition as well as towards healing the damage that has already been done. Bathe to heal those tendons: If the dull pain is radiating to the surrounding areas, a soothing essential oil soak can help to alleviate the pain and the inevitable mental distress caused by it. The hot and the cold of it: Instead of regular cold and heat therapy, when essential oils are added to the mix, they not only bring down inflammation more rapidly but also increase the rate of tissue regeneration significantly. Keeping things in place: In case of broken tendons, the connective strands need to be held in place to allow them to recover faster. A poultice can get the job done, but if you want more from the herbs, adding essential oils to the mix can do the trick. Lemongrass is a superlative oil for healing tendons. It regenerates the connective tissue, repairs the broken tendons and helps in regulating the blood flow. Marjoram helps with muscle spasms / discomfort, rheumatism, strains and sprains. It reduces the tension between muscles and tendons, thus helping in the repair of broken tendons. Wintergreen is helpful in rheumatism and muscular soreness and discomfort. It is also known for its ability to alleviate pain in muscle tissues, offering a cortisone like action due to its high content of methyl salicylate. Wintergreen is also an all-natural anti-inflammatory. If you believe muscle soreness is the cause for your frequent instances of broken tendons, wintergreen is the oil to use. 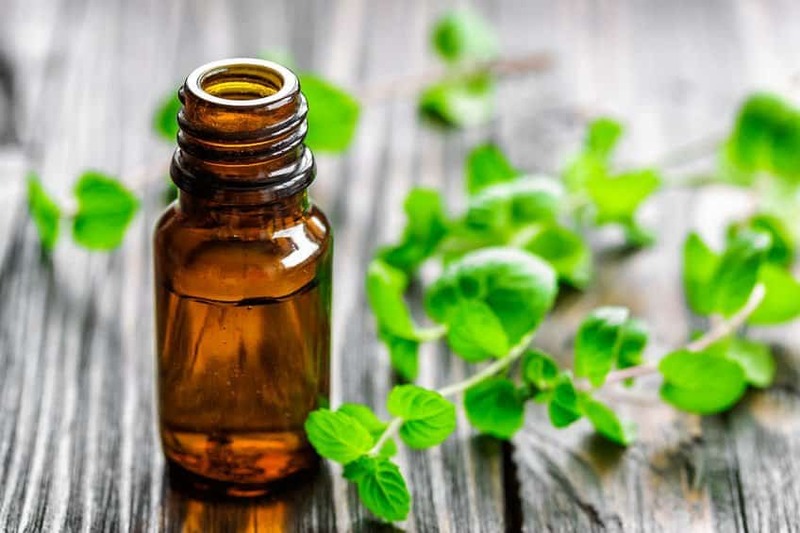 In addition to what peppermint is popularly known for (irritable bowel syndrome, colds, headaches, sore muscles, sinus congestion and much more) I generally use it to intensify the effect of other oils I am using. 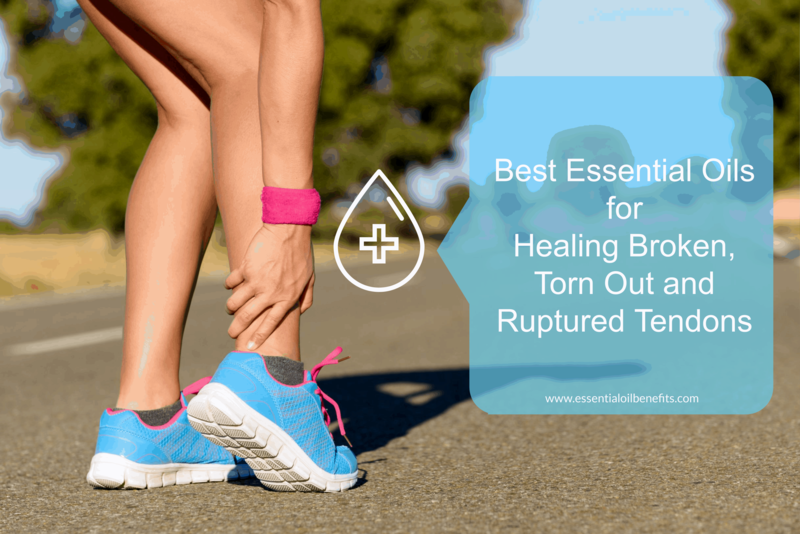 Oregano, lemon, lavender, helichrysum, cypress, birch, rosemary and sweet basil are some other essential oils to consider for the healing of broken tendons. Mix 2-3 drops each of wintergreen, birch and lemongrass in 2 tsp of jojoba or sweet almond oil and apply on the damaged tissue. Layering the impacted area with 2 drops peppermint after a couple of minutes might help “drive” the essential oils deeper within the cells. Using a warm compress can also be beneficial. Follow this procedure 2-3 times daily until muscle soreness is reduced. Mix all the ingredients in a dark colored bottle and roll it back and forth for a minute or so to warm the essential oils and mix them properly. Use this blend straight out of the bottle and gently massage on the damaged tendon. You can also apply this using a warm cloth. In order to open the pores, place the warm cloth over the impacted area for few minutes. Thereafter, apply the blend and massage for at least 5 minutes. Make use of a spray bottle if the injury is too distressing to massage. For serious injuries, add 2-3 drops of helichrysum. Tendon pain is more deep seated than muscle pain and typically on or around the joints. The best way to describe it would be a dull, deep ache that gets sharper when the affected area/joint is moved. Depending on how intense the injury/inflammation is, the area right above/around the affected tendon may be tender to touch and will feel warm. Although the swelling in case of tendon strain, tear and inflammation is mild, the pain and the swelling can build up over time. The development may often seem sudden because people tend to ignore/get used to the discomfort in the initial stages, given its dullness. In some cases, calcium deposits may eventually become a part of the ailment’s spectrum and that is when things go from dull ache to excruciating agony. That said, pain is always a red flag raised by the body, a clear indication of trouble about to hit. Hence, it is best tackled sooner than later. So, even if the soreness is mild at first, try this healing, pain relieving blend. Mix all the oils together and store in a dark glass bottle, away from direct exposure to sunlight, heat and moisture. You will only need a few drops of this blend for each use. Remember to put the cap back on tight after use. Fill a large salad bowl half way through with water. Add a heaped tablespoon of Himalayan pink salt or sea salt to it. Stir till the crystals dissolve. 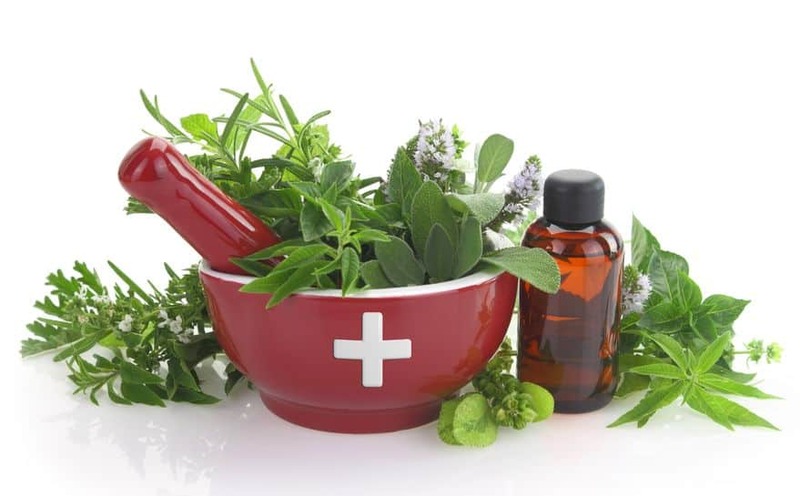 Mix 2 drops peppermint and 3 drops geranium oil with a teaspoon of milk and add to the water. Throw in 8-10 ice cubes or enough to get the level of water to a few inches below the rim. Stir the “arctic cool” concoction and soak a small towel in it, wring gently and use this to treat the sore area. For the first 48 hours, use this three times a day. Wipe the treated area dry and then follow immediately with the pain relief blend. Apply using gentle, circular strokes with minimum downward pressure. Cover the entire affected area, even going a few inches beyond it. The link between pain and inflammation is both complex and cyclic. Inflammation causes swelling and as the bulging tissue presses against the other structures, pain comes into the picture. But as the intensity of the pain increases, so does the inflammation. More inflammation leads to more pain and the vicious cycle continues unless stopped at some point. Also, persistent inflammation can lead to chronic pain and heightened nerve response to the discomfort. Think of it this way, constant inflammation calls for the nerves to continuously send pain signals to the brain. Over time, these receptors develop heightened sensitivity to pain impulses. Once this happens, even light stimulation, which would otherwise/normally not be painful leads to discomfort. The heightened nerve excitability (hyperalgesia) is often a result of damage to some CNS components. Making the blend simply involves mixing all the oils together and storing them in an amber/blue glass bottle. Depending on just how sore the area is to touch, apply the oil as you would an ointment or use it to massage the sore bits. Don’t play rough house with your joints; if there is inflammation, they have already been through a fair bit of suffering. The ministrations are meant to gently stimulate circulation and aid in the removal of accumulated toxins and metabolic waste. So, massage with upward strokes, facilitating the faster and more efficient movement of lymphatic fluids. Use this blend twice a day for 2 weeks. For chronic inflammation, dilute further by using 80 ml carrier oil with the same quantity of essential oils and continue to use for up to 2 months then take a break of 1-2 weeks. Make a blend by mixing together 30 ml coconut oil (fractionated will do if virgin isn’t available) with 1 heaped tsp licorice root powder, 6 drops each of peppermint and lavender oils, 4 drops sweet basil and 2 drops clove oil. You will need enough gauze bandage to go around the sore joint/area a few times, some plastic wrap and crepe/compression bandage. Generously apply the blend on the affected joint. Add some more carrier oil to what remains and soak the gauze bandage in it. Wrap the affected joint with the oil-soaked bandage and then with a round of dry gauze bandage. To keep the oil from being soaked up by your clothes/bed cover, cover the area with some plastic wrap and finally restrict mobility with the use of crepe bandage, but don’t wrap it too tight. You are not trying to restrict blood flow here. Leave it on overnight. After seven days stop this treatment and continue only with the inflammation-relief blend. You can reuse the oil bandage treatment whenever the pain is too intense. The problem with tendons is that they are simply not as metabolically active as the muscles, which means that they don’t get as much blood supply as the muscles. Unfortunately, lower oxygenation and lesser availability of blood means slower healing and repair time. This is one of the reasons for the chronic nature of tendon injuries. Also, lower metabolic activity equates to the slower clearing of toxins and accumulated fluids. This greatly increases the risk of inflammation and further slows down the repair process. So, when you are dealing with a tendon tear or any kind of micro or macro trauma involving the tendons, the first order of the day should be to boost circulation. Next in line is, of course, inflammation control and finally, you also need to offer help from the outside to speed the synthesis of collagen in the affected area. Initially, rest is certainly recommended, but once the affected tendon is on the mend, gentle stretches and exercises can help much to ensure that once healed, the tendon is as strong as or even stronger than what it used to be. Here is two pronged approach that can help. Mix the oils and store in a dark glass bottle. Use as you would a massage oil on the affected tendon, joint and the surrounding areas. Massage in upward direction but don’t press down too hard. Use this blend twice a day for best results till the tendon heals completely. You can apply this blend before stretching the healing tendon. Put all the ingredients (all the dry powders and the oils) in the food processor with a few tablespoons of warm water. Process for 1-2 minutes till you get a smooth paste. Apply on the affected part in a thick layer and cover with gauze strips soaked in green tea or lemon hydrosol. Cover with cling wrap and then with crepe tape. Place a heating pad on the bandaged area, treating the sore tendon to heat therapy for about 20 minutes. Let the poultice stay in place for 2-3 hours then remove and wash the area with warm water. Using this poultice once a day significantly speeds up the healing process. The poultice can be used both in the resting and the stretching phases of recovery. That said, you can stop using it once the pain becomes tolerable, which is a clear sign of recovery. But, continue using the healing oil blend till complete recovery is achieved. Typically, using the poultice for 4-5 days after an injury or strain on the tendon will be enough to get you to the halfway point in the recovery process. Stretching a tendon on its way to recovery after a tear/rupture is hardly a pleasurable task. Of course, there will be pain, and it can be quite the deterrent. So, deal with it as soon as it hits by mixing 6 drops each of black pepper and peppermint oils and 4 drops each of lavender and cypress essential oils in 30 ml of a carrier oil of your choice. Store in a bottle with a roller ball head. Use immediately after stretching or even before to keep the pain in control. In case of intense pain, add 5 drops of wintergreen oil to the blend. But this one should be reserved only for when the pain is too much to bear. The problem with tendon degeneration that results from auto-immune ailments or chronic strain is that the condition does not always involve inflammation, certainly not after the initial phase. Although the pain is chronic and often intense, tendon biopsies have revealed that in such cases, there is no inflammation but the presence of a significantly higher amount of the neurotransmitter glutamate in the affected area. Despite this, NSAIDs and steroid injections are often recommended for chronic tendinopathies of the Achilles and patellar tendons. Needless to say, at best these only offer temporary relief from the pain. Unfortunately, when you look for information on essential oils for such conditions, there is a lot of repetition of inaccuracies. The logic here is if you are not dealing with an inflammatory condition, anti-inflammatory oils may not help much if they don’t influence the levels of glutamate and glutamate receptors in any way. Yes, pain relief is needed but this should not come at the cost of immune stimulation, particularly if an auto-immune disorder is to be blamed for the degeneration of the connective tissue. In fact, stimulating the immune system will cause further harm. Mix the oils and store in a dark glass bottle. Use twice a day when the pain is intense and just once for the deep dull ache that often results from such conditions. If the pain is intense, use a mixture of 5 drops each of laurel leaf and cinnamon leaf, 6 drops calamus root and 7 drops peppermint essential oils in 30 ml carrier oil. You can use this blend in combination with the one above, but space the applications 4-5 hours apart. Do a patch test for both blends before using them. If you intend to use them continuously, always take a break for 1 week after 4 weeks of consistent application to give your body the time to purge out the leftover bioactive compounds from the system. Mix the essential oils with 1 tsp of milk and set aside. Draw a hot bath and mix the salts and the milk-oil blend in the water, while the tub is half way full. Agitate the water to dissolve the salt crystals and disperse the oils. Fill the tub all the way and agitate the water one more time before soaking yourself in its healing goodness for 20-30 minutes. Do this every alternate day when the pain is intense and 2 to 3 times a week once the pain dulls. Even on its own, pain, whether chronic or acute, leads to stress. Then, there are all those sleepless nights that add to the mental distress. Put these together, and you end up with sky rocketing cortisol levels. The bad news is that cortisol can greatly impede the healing process by adding to the body’s inflammatory response. So, when you are battling an injury of any kind, it is crucial to keep your stress levels in check. Fortunately, essential oils make quick work of lowering cortisol levels in the body. The best part is that the right blend can help you to take that trip to dreamland, despite the hurdle of pain. For day time use, opt for a blend that contains 3 drops of lime and 2 drops of sandalwood essential oils. Use in a reed diffuser or in aromatherapy jewelry or simply put a few drops on a handkerchief, and this will keep you going through the day, despite the pain. You can expect relief using a single oil or a blend of multiple oils. In order to spread the oil over a larger space, use carrier oils like Coconut and Olive oil. You may use a hot / cool moist towel to help essential oils penetrate deeper. Alternatively, a heat pack or a cold pack can be used depending on your injury. If you have strained, sprained or torn a tendon, essential oils can take the pain out of the healing procedure and make it less tedious. I personally recommend the tips mentioned above to speed up the healing and make the repair process easier for your body. 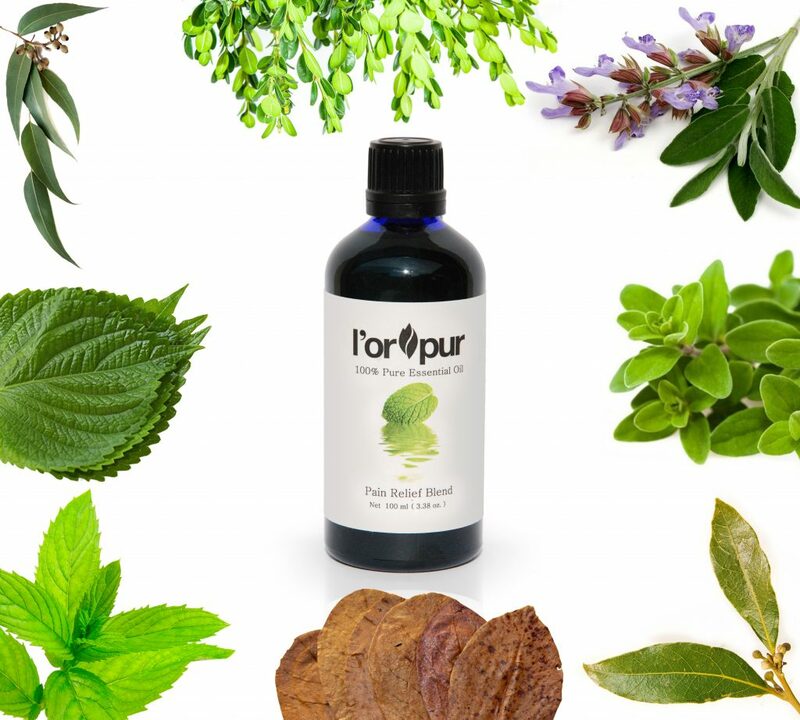 The all-natural L’orpur Pain Relief blend contains a blend of essential and carrier oils in a proprietary mix specifically design to target all pain areas. All you need is apply a few drops to the affected area twice daily for maximum relief. No measuring, blending, mixing, diluting, etc. is required, thus saving you time and money! I am 6 weeks out of ACL and Meniscus repair surgery of my right knee. The swelling came down initially but part of it is still there and is not going away. Also favoring the other leg seems to have taken toll on left as well. There is pain in the back of left leg when it is bent for longer time or coming out from squat position. There is no severe pain as such, but is there a recipe which I can use to reduce the swelling and accelerate the healing process. You can use 5 drops each of lemongrass, rosemary and yarrow essential oil in 30ml carrier oil. Apply to the affected area twice daily. Thank you so much, I will try it and let you know. I would NEVER use baby oil as a carrier oil. It is a petroleum product and extremely bad for you. Use coconut, almond, jojoba or any natural organic oil. Thanks for sharing, much appreciated. You can also read my comment of the 6th of Jan 2017 about baby oil. Can you tell me which oils are best for inflammation around the hip area I am waiting to see a physiotherapist but some days it is very painful. You can refer to the post below for dealing with inflammation using essential oils. Hi, I have torn my Acl in my both knees and pcl in my left knee, MRI says they are small intrasubstance tear(I guess it’s partial) . Doctors and Pyshiotherapist says torns cannot be healed, but strengthing knee muscles can help to avoid from the further damage, will essential oils help to recover completely from these tears? ANd what oils I can use in my recipes? I’d use 5 drops each of helichrysum, wintergreen, peppermint and chamomile diluted in 1 ounce jojoba oil. Apply to the affected areas 3x per day. What oil recipe would help a young man heal from having his tendon that holds his pelvic to his body severed in a really bad car wreck. Right now now he is on 3 different pain killers and is unable to get out of bed until sometime in May. You can try a recipe of 6 drops each peppermint, wintergreen and 4 drops lemongrass diluted in 1 ounce fractionated coconut oil. Apply up to three times daily to the affected areas. You can start with any of the recipes in the post or if you already have essential oils, let me know which ones and I’ll make up a recipe for you. I was diagnosed a little over a year ago with a grade two calf strain due to a sports injury. The injury caused a hematoma behind the knee and a blood clot in the calf muscle. I was unable to perform any activity for the first six months. I have been doing rehab exercises since then to strengthen the muscle. However, I seem to have issue with blood flow and continual stiffness in the calf muscle and behind the knee, especially when sitting for long periods of time. I also dealing with an aching pain (minor swelling as well) in the calf and behind the knee when over used. I am wondering what kind of oils can help increase blood flow and eliminate the stiffness (and swelling) in the muscle. Any suggestions would be appreciated. Thanks. Blend the above oils and apply to the affected areas twice a day. For pain relief, you can always try L’orpur pain relief blend. am happy to avoid them and use oils instead! You can use EOs such as lemongrass, oregano, frankincense, basil, peppermint, helichrysum, cypress, birch and wintergreen. Dilute 5 drops of any 4 of the above essential oils in 1 ounce (30ml) almond or coconut oil and apply to the affected areas 3 times a day. Dear 25 years ago the tendon of my fore finger(upper part) of left hand broke in an accident… Due to which it is unable to straighten my finger from top joint. Now a days i am using the finger supporter device to improve and regenerate the tendon…. Can my tendon develops again by the help of essential oils.. Plz reply and yeah mention the recepie of oils too.. Although there’s no guarantee, you can always try. You can use EOs such as helichrysum, cypress, frankincense, birch, etc. Dilute approx. 12-18 drops in 1 ounce of carrier oil and rub a few drops around the finger 2xdaily. I have a very sore deltiod muscle a stage 2 , I wanted to ask would the wintergreen essential oil be the best way to go , I will be wearing a shoulder brace . Im taking Arnica tablets and magneasium with a little bit of yoga streching . You can use a blend of wintergreen and peppermint for deltiod muscle, say a total of 18 drops in 1 ounce carrier oil. Apply 2-3 times per day to the affected areas. I don’t believe EOs will make the tendon regrow. Please consult your doctor. Not sure if you have considered L’orpur pain relief blend. Hi recently ruptured my Achilles Tendon and am taking the Non Surgical approach to heal it. I’m in the early stages and haven’t begun phsio therapy yet and am not in much pain but would like to make sure I’m getting the right oils to promote a good repair of the tendon. 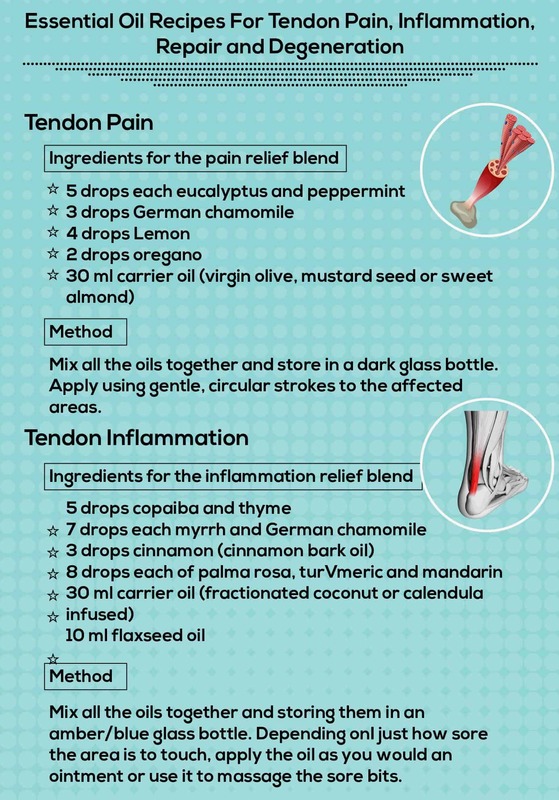 You can use essential oils such as peppermint, cypress, clove, helichrysum, wintergreen, frankincense for promoting repair of Achilles tendon. Prepare a blend of 3 of the above essential oils, 15 drops total in 30ml carrier oil (almond or coconut) and apply twice a day to the affected areas. Playing soccer tore my ligaments pcl completely and acl partially. It seems to be getting better but the doctor says to strengthen muscles as ligaments won’t heal.I applied peppermint oil and first day results are not bad, but if I plan for full recovery what oils do I need to use? I would add a few drops of tea tree, wintergreen and eucalyptus or lemongrass tot he peppermint, a total of 15 drops diluted in 1 ounce (30ml) carrier oil (coconut or almond oil). Apply 2-3 times a day. In case of pain, you can try L’orpur pain relief. You can also do some gentle stretching and yoga to assist with your recovery. Indeed, helichrysum is great to aid in recovery. You can also add a few drops of frankincense and peppermint. Please dilute in a carrier oil before application. You can use 5 drops each in 1 ounce carrier oil. Please dilute 15 drops of peppermint in 1 ounce (30ml) of almond oil and apply to the affected areas 2-3 times daily for healing of the torn rotator cuff. You can add 3 drops of chamomile to the blend, however optional. If in pain, you can always try L’orpur pain relief blend. I had that surgery and used, Frankincense, and Helichrysum. Sure, please let me know how I can help. No worries, you can get all the essential oils for the tendon strains Recipe 1 from the company below. I have my own range, but out of the ones you are interested in, I only have organic peppermint. I suffered a serious injury over two years ago in which my longus and brevis tendons below the epicondyle were torn. Pain is still there – although I now have movement etc. What would you recommend? You can use l’orpur pain relief blend up to three times daily for maximum pain relief. You can read more about it here and also the testimonials from various customers. I had accident two months ago. Had MRI yesterday result of MRI terrible. ACL *year more than 60% along with *level medical meniscus tear in central part. Doctor told me report is saying 60% but as per his experience I have 100% ACL tear. Now I have to undergo surgery. Due to some reason I can’t​ go for till 30-45 days. Can provide me blend that help me prevent pain as well as further injury also improve strength of meniscus. Might be till one month I get atleast 10-30% recovery by using oils. You being person having medical knowledge need some advice on it. If you have any other questions, please do not hesitate. I have a bad rìght shoulder. My tendons and joints have been weakened by taking a furoquinole antibiotic. I then pushed myself too far when contracting weights and pulled my tendon. My right shoulder blade is in constant pain. What would you recommend? For pain relief, you will be pleased with my own 100% natural l’orpur pain relief blend. Say goodbye to pain after a few days’ of application. If you are based in UK, shipping is set at $9 flat. In case you’d prefer to try out your own recipe, you can make up a blend of 6 drops each of vetiver and black pepper and 4 drops each of wintergreen and peppermint diluted in 30ml sweet almond oil. Apply up to 3 times daily for prompt relief. I have torn a ligament which has good blood supply in the peripheral part of my tfcc (wrist) . Im a Dentist. Ive stopped work because im scared of making it worse. The mri revealed a tear of the ligament off the bone with only a few fibrils intact. Ive had a steroid injection just last week. I don’t thinks its helped. Ive done numerous things to try speed the healing process. Im not using my hand. Resting it well. Its been about 3-4 months now. Im contemplating surgery but id rather avoid this! Any thoughts? Sorry to hear about your issue. You can start on essential oils, however they will take some time to start the healing process (2-4 weeks). If you have any other queries, please don’t hesitate, happy to help. I have a 22yr old son that suffered a brain injury 2 yrs ago. His toes on his left foot have curled under. Now his fingers are starting to do the same thing. Is there anything that will help him straighten them back out? Thank you for any advice you can give me. I am so sorry for what happened. There’s no guarantee that this will work, but I guess it does not hurt to try the following: use 3-5 drops lemongrass essential oil diluted in 1 tsp of fractioned coconut oil and apply to the affected areas. No worries, looks like you have had it a bit rough. I would recommend you go straight to my own l’orpur pain relief blend. It will definitely put you out of your misery, simply apply to all affected areas up to 3 times daily for fast relief. It comes with a spray head also. I have sprained my medial collateral ligament and RUPTURED my ACL. Due to no activity for the past two month, doctors can’t decide if I need surgery or can’t make any decisions until I get my knee back on movement. Apparently by exercising swelling should go down but it’s a slow process. I’ve been told oils will help to the recovery of my injured knee together with physio. What would you recommend? Sure, essential oils will definitely help. You can make up a blend consisting of 8 drops wintergreen, 6 drops peppermint and 4 drops roman chamomile diluted in 30ml almond oil. Apply this blend on the affected areas 3 times a day. If you are experiencing pain, you may wish to try my own l’orpur pain relief – you’ll be glad you did. Any other questions, please do not hesitate. Sure, if you want to deal with pain in your ankle, you can make up essential oil recipes; if you need help with it, please let me know. Alternatively, you can try my own blend of pain relief blend, L’orpur and you can be sure that you will not be disappointed with it. You can use it up to three times a day on the affected areas and comes with a spray head for convenience. You can read people’s testimonials at the bottom of the page as well. Please do not hesitate to reach out if you need more info. Hello I have severe tendinitis on my left foot can you recommend a blend. I also will be purchasing the pain solution you recommend. For tendinitis / tendonitis in your foot, you can make up a blend consisting of 6 drops german chamomile, 4 drops each of rosemary and marjoram and 3 drops eucalyptus diluted in 30ml almond oil and apply to the affected area three times a day. Also please make sure your diet consists of anti-inflammatory foods, such as fresh fruits and vegetables, fish, nuts and seeds. If you have any other questions, please don’t hesitate. Indeed I have many customers from Canada buying l’orpur pain relief. There are no issues with customs clearance. Hi Olivia , in recipe No . 2 you mention the possibility of using baby oil , I havent read this yet and I was of the thinking that the mineral oil in it is not good for skin although they do use it for babies skin . Does it penetrate well and is it indeed good for skin in any way ? Baby oil it is an option as it creates a protective barrier, retains moisture and softens the skin. However, it does not penetrate the skin as well as a carrier oil. I would still prefer to use this blend with a carrier oil such as coconut or almond oil. Can you please advise a Mix for severe lateral epicondylitis. I have had it for about 8 weeks and it is defy ing all my attempts at remediation. Essential oils won’t cure epicondylitis, however it will help to deal with the pain that you are currently experiencing. You could use a mix of 5 drops each of peppermint and helichrysum essential oils in 2 tsp of almond oil and apply to the affected area three times a day. If you don’t want to make up your own blend, you could also try my own blend of L’orpur pain relief blend, which has proved to be very beneficial. Any other issues, please do not hesitate to reach out. My mother has spondylitis, doctor asked her to have neck collar, one says the vertebrae are compressing the nerves, Now will be taking second opinion. Would like to know which oils can be used to reduce the pain and discomfort. For pain and discomfort, you can bank upon my own pain relief blend which has proved very successful with numerous positive testimonials. Please refer to the link below which has all the necessary information. If you need more info, do not hesitate to reach out. The best essential oil you can use is 5 drops of peppermint diluted in 1 tsp of sweet almond oil. Repeat up to 3 times a day for as long as you require. If you experience pain, do not hesitate to try L’orpur as you will be glad you did. 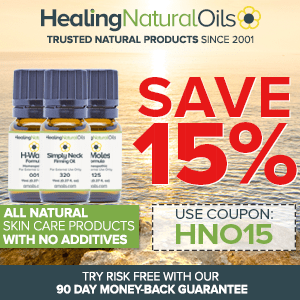 You can try the following blend for hamstring injury: 15 drops eucalyptus, 15 drops rosemary, 8 drops lavender, 8 drops roman chamomile – all mixed with 2 tsp of sweet almond oil. Just remember that hamstring injuries take from 4 to 12 weeks to completely recover / heal, so patience is key. If you are experiencing pain, l’orpur will certainly help you to get though. What type of coconut oil can be used as a carrier oil? You may use fractioned, extra virgin or organic coconut oil. How much coconut should I use? It all depends on the amount of essential oils and the recipe you are making. Can you please confirm. I am going to use recipe #1 for broken tendons. For recipe 1, use 2 tbsp. of coconut oil as carrier oil. what about hair growth, is there a formula for that? You are welcome. If you need further assistance, please drop me a line. How to get releive for a knee injurie on the inside of the leg. You can use the essential oil recipe below for relief in knee pain. Add the following essential oils to 1 fl. oz (30ml) carrier oil such as jojoba oil: ginger – 3 drops, black pepper – 3 drops, rosemary – 6 drops. Mix well and apply to the affected area up to 3 times a day. Alternatively, for pain relief, you can try l’orpur. I’m just recovering from carpel tunnel and trigger finger surgery on four fingers . They are very stiff and doctors say I have very frayed tendons and that they are also shortening so my fingers don’t straighten out. I have just started using organic coconut nut oil with a few drops of lavender infused, on the first hand as the incision is healed and in several days feel comfortable to start hand number two on an infusion treatment but now reading your info I am willing to add more ingredients. What is your best recommendation? And do you have any other stretching and strengthening techniques you could recommend? You can add Rosemary (8 drops), Eucalyptus (6 drops), and Wintergreen (16 drops) essential oils to Lavender (4 drops) and dilute in organic coconut oil (30ml). Few exercise to straighten your stiff fingers: 1. Use your other hand and gently straighten and bend the injured finger by using repeated slow motions, 2. Place your injured hand flat on a surface with the palm facing down and lift each finger one at a time. If you need any more assistance, please let me know. Sure, you are welcome. You can use either the single essential oils or recipes, however with double carpal tunnel surgery, I would advise that you go with Recipe 2. If your mum is experiencing pain, you could always try l’orpur for pain relief. It will provide immediate and sustained relief – you can read the various testimonials from people in the comments section. Would an ounce of carrier oil be enough for recipe #2? Or should just use half the recipe for an ounce? You can try an ounce, however the dilution will be at 4-5% which is more concentrated than the recommended 2-3% for topical use. If you can stand the slight burning sensation, it should be fine to go with one ounce of carrier oil, otherwise, use half the essential oils. Given the diagnosis of severe bone bruising, I think it would be more appropriate if you followed up with your doctor as I am not sure I am able to assist. You could try my l’orpur blend for pain management, however this will not fix the bone injury itself. If you need more help, please let me know. I saw your article on healing broken tendons. My question is do those protocols work for a labram? Ligaments? Other connective tissues i.e. menicus? Which protocol is best? Thank you, just looking for a natural way to speed up my healing process. The essential oils and recipes should work equally well to help the healing process for labrum, ligaments, meniscus, etc. You may start off by trying Recipe 1. If you need more help, please do not hesitate to get in touch. Can i use this for the posterior tibial tendon dysfunction of my left foot ankle? Essential oils or recipes noted within the article will definitely help with the healing process and pain management. Please let me know if you need more help. Just wondering about your views of essential oil ingestion. Please do not ingest any essential oils prior to discussing with your doctor. I injured my forefinger with a mixer beater. I dislocated it but put it back in place meals immediately after it happened. I don’t break any bones and the Dr said my tendons are fine but scar tissue seems to have caused the finger to not bend. I’m not believing about the scar tissue story but….. Anyway, my second joint is still red and tender to the touch and swollen. You can also see bruising at the joint especially after i do the stretching exercises the therapist has me doing! This is has been going on for 2 months! Do you have any suggestions to what I can do to try to heal this finger? My gut is telling me something is wrong with a nerve in my finger. Any help is appreciated! For the swelling and redness in your finger, you can use either Juniper or Lavender essential oils mixed in a carrier oil such as Almond oil. Juniper or Lavender have anti-inflammatory qualities that should alleviate the root cause of your swelling. Over time, the swelling should subside and your joints may start to soften and finger unfurl. My preference would be Juniper oil. If your problems persist or in case it is nerve-related, please consult a doctor. Hi my friend has a torn tendon in her hand that has caused swelling. She also suffers from sever carpal tunnel. What would you suggest to do? You can try any of the recipes and method of application mentioned in the above article. If your friend does not get any relief, please consult a doctor. Do you know if essential oils are safe to use during pregnancy? My daughter is 27 weeks with third child. Other two came 2wks early. Baby is sitting low this week and causing low back pain. She got a massage last week. Can’t always afford that. I thought maybe she’d get some relief from oils and my using tennis balls on her or chair massage pad. Thank you. Thanks for your question. To be completely on the safe side, it is best if your daughter stayed away from essential oils during pregnancy. Sorry, I cant help further at this stage. thank you for this recipe My 85 year old dad went into rehab in April and due to not getting out of the chair much has become contorted, he was standing straight and walking before this, and the back of his hamstrings are so tight he can hardly stand. I’ve used ortho ease and ortho sport massaging oils on him since we brought him home 2 months ago but the tendons are still very tight. Any other ideas? Rosemary 10 drops, Eucalyptus 10 drops, Chamomile 5 drops, Lavender 5 drops, then add 2 tablespoons of carrier oil (Sweet Almond Oil). Massage this 2 to 3 times daily. Further, one of the most important thing to do is gentle exercise and lots of stretching. However, your dad may likely aggravate his condition with exercise at this point. Stretching should feel good, not bad. Ice will also assist with muscle strains. Use the ice method and the ice packs for at least ten minutes three times per day. In your dad’s case, I would also recommend that he sees his physician as this is limiting his daily activities.